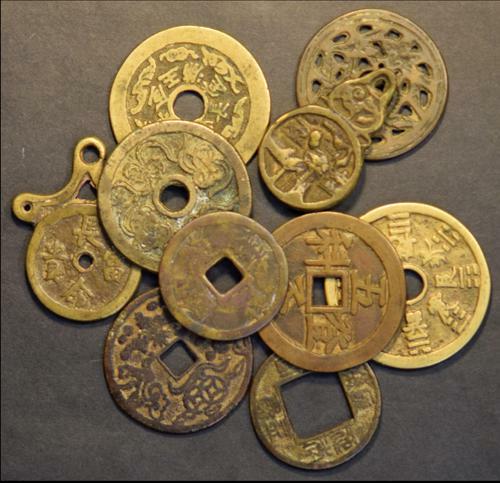 A group of 10 vintage copper medals with fortune power, a few may be fake. Need viewing. 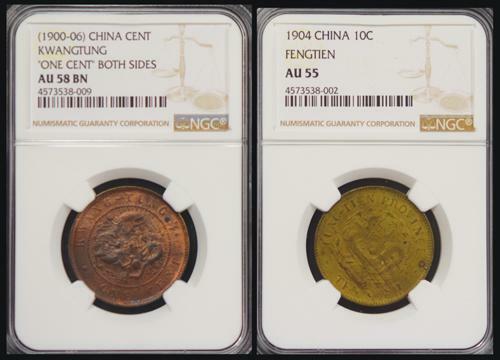 1900s two Kwang Hsu Yuan Pao Copper Coins, namely, (1900-06) Kwangtung One Cent, NGC AU58 BN and 1904 Fengtien 10 Cash, NGC AU55. 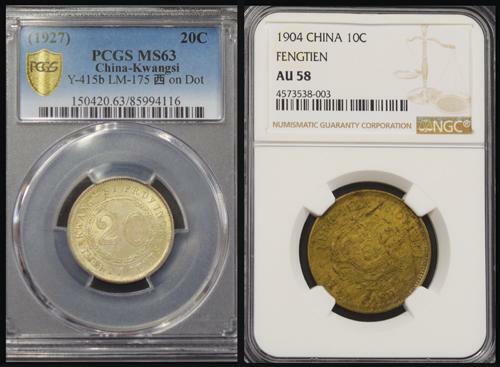 1904-27 one Copper Coin and One Silver Coin, namely, 1904 Feng-Tien 10 Cash, NGC AU58 and 1927 Kwangsi 20c, Y-415b, “西” on Dot, PCGS MS63. 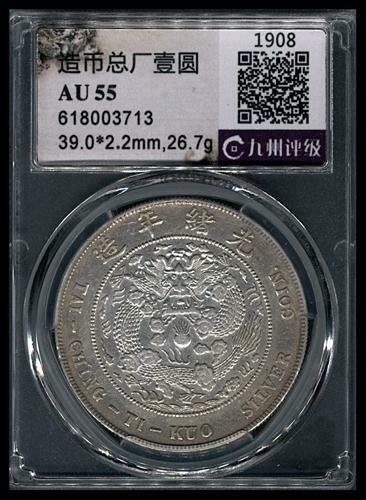 1912-14 a group of 3 ROC Silver Coins, comprising two 1914 Yuan Shi Kai $1 and 1912 Memento $1. All VF. 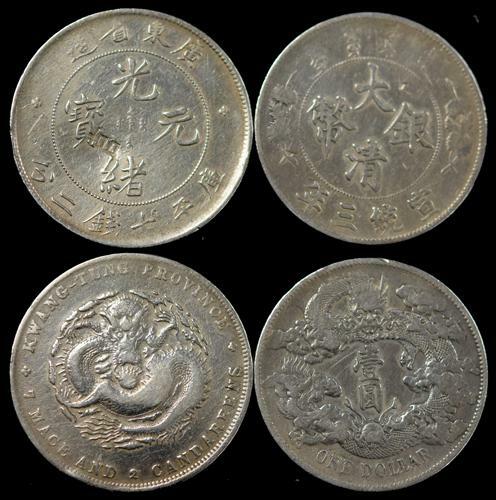 1914-35 a group of 4 ROC Silver Coins, comprising one 1914 Yuan Shi Kai $1, two 1921 Yuan Shi Kai $1 and one 1935 SYS $1. Extremely Fine to AU. 1920s two Chinese coins, 1923 Yunnan 10c and 1920 ROC 10 Coppers. Graded by CCGS MS64 & XF45 respectively. 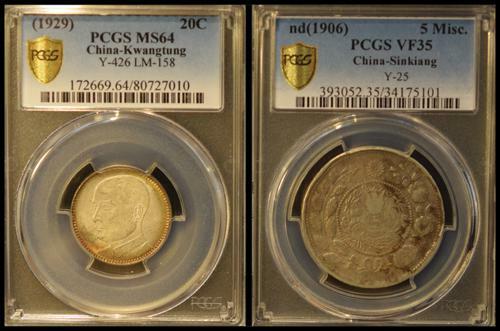 Two Imperial & ROC silver coins, namely Ta Tsing Silver Coin Sinkiang 5M, PCGS VF35; 1929 Kwangtung SYS 20c, PCGS MS64. Two Ta Ching Silver Coins, namely Hsuan Tung Year 3 Ta Ching Silver Coin $1 and Kwangtung $1. Both VF. Cleaned. 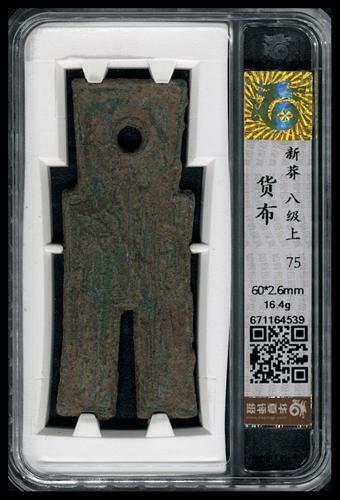 Hsin Dynasty Ancient Coin, graded by Hua Xia 75. 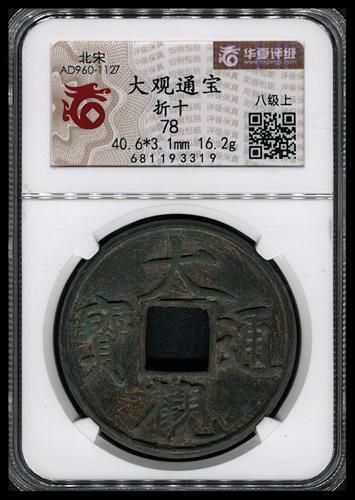 Song Dynasty Ta Kwan Tung Pao, graded by Hua Xia 78. 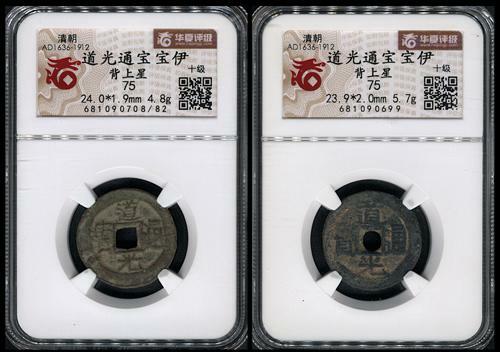 Chin Dynasty Ta Ting Tung Pao Copper Coins x 2 types, Hua Xia graded 78 & 80 respectively. 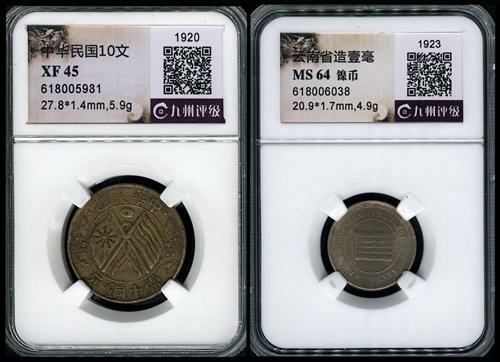 Ming Dynasty Chung Tsing Tung Pao Copper Coins x 3 types, Hua Xia graded 80, 82 & 75 respectively. 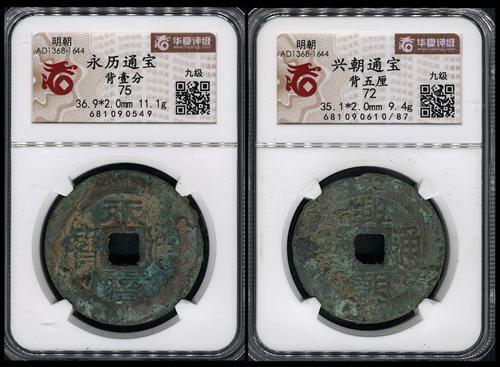 Ming Dynasty Hung Hwa Tung Pao & Hing Chiu Tung Pao copper coins, Hua Xia graded 78 & 70 respectively. 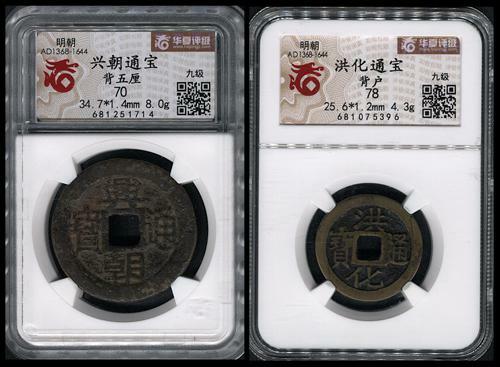 Ming Dynasty Wing Li Tung Pao & Hing Chiu Tung Pao copper coins, Hua Xia graded 75 & 72 respectively. 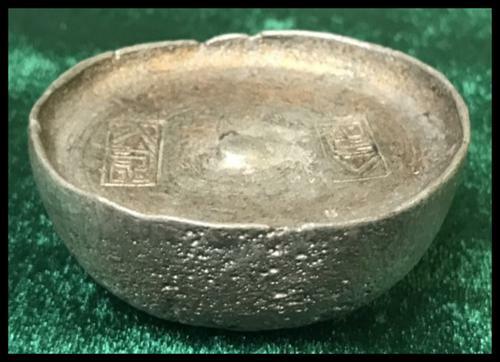 Ching Dynasty 5 Tael Silver Ingot, beautiful and unusual. 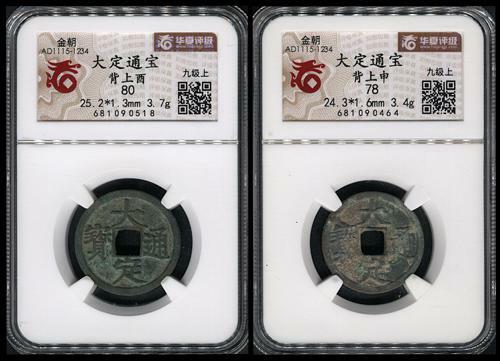 Tao Kwang Tung Pao Copper Coins x 2, both graded by Hua Xia 75. 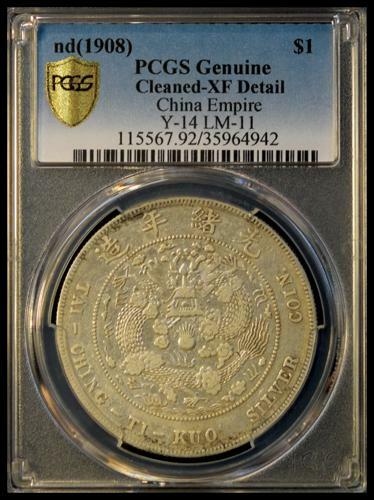 Ta Ching Bronze Dollar: 1911 10 Cash (Y-27), graded PCGS Genuine, VF Details. Ta Ching Copper Coin: 1905 Board of Revenue 10 Cash. Y-10. 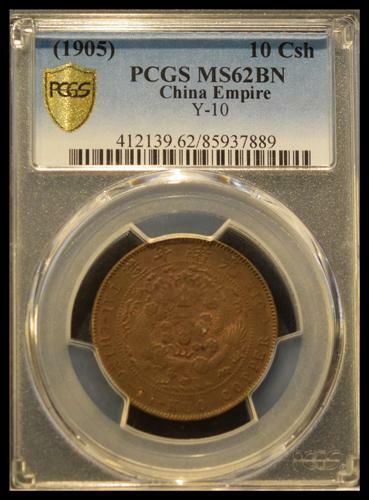 PCGS MS62 BN. 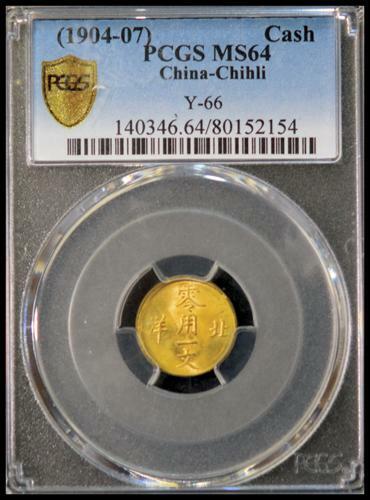 Kwang Hsu Tung Pao Bronze Coin: ND (1904-07) Chihli 1 Cash (Y-66), graded PCGS MG64. 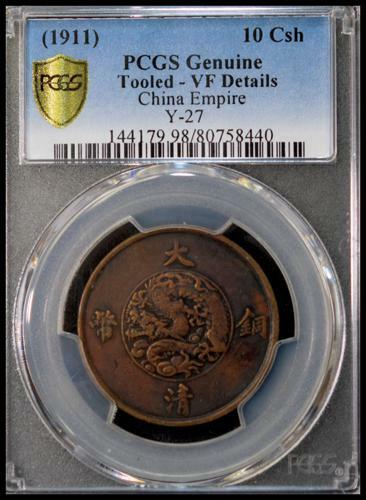 Kwang Hsu Yuan Pao Copper Coin: 1903 Feng-Tien 10 Cash. Y-89. 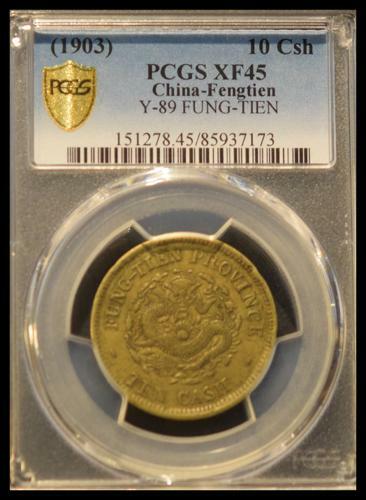 PCGS XF45. 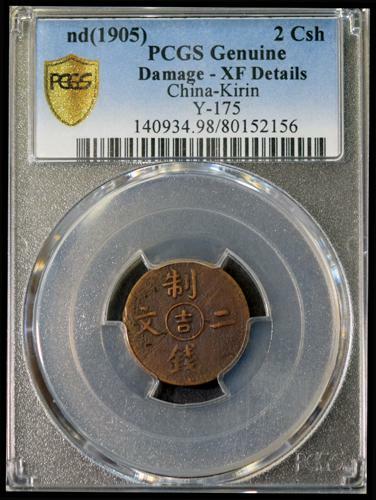 Kwang Hsu Tung Pao Bronze Coin: ND (1905) Kirin 2 Cash (Y-175), graded PCGS Genuine, XF Datails. Birth of Republic of China Copper Coin, Kansu 20 Cash. 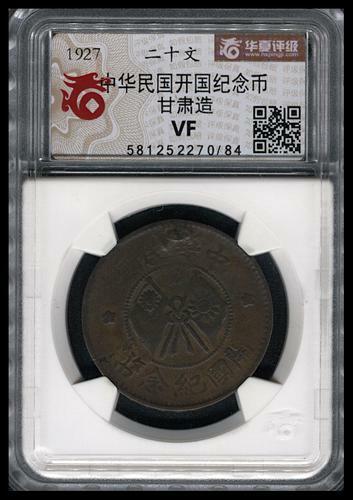 Hua Xia graded VF. Kwang Hsu Yuan Pao Silver Coin: ND (1908) General Mint $1. Y-14, LM-11. PCGS Genuine. XF Details. 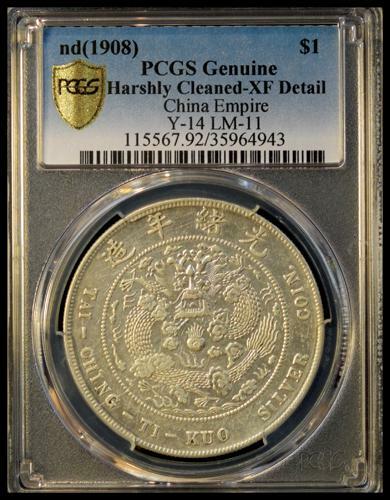 Kwang Hsu Yuan Pao Silver Coin: ND (1908) General Mint $1. Graded by CCGS AU55.